No toddlerhood or preschool years would be complete without a little bit of unexpected sleep concerns. 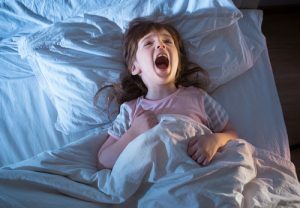 From early wakeups to bedtime fears, many kids this age develop ways of getting out of bed and into yours in the middle of the night. Help them to navigate bedtime and nighttime sleep with these tips. You’ve arranged his stuffed animals, tucked him in, adjusted his nightlight so that the room is exactly the way he likes it, and you’ve kissed him goodnight. But a few minutes after you’ve left his room and dared to breathe a sigh of relief, he’s back up, calling for you. Practice the “silent return” to his bed, but gently guiding him back to his bed, and leaving the room quietly. Don’t act angrily, and don’t engage with him. Your goal is simply to return him to bed without rewarding him for getting up. In some families, early waking becomes a major problem, preventing parents and kids from getting the amount of sleep they need to function and maintain good health you’re your little one is consistently waking up before the sun, consider a few quick fixes. Some kids simply need less naptime in order to get a good night’s sleep. Others are wakened by the sun, and blackout curtains can be an easy solution. Other families have found that an “OK to Wake” clock does the trick; this type of clock changes color at a time that you set, letting your little one know that it is OK to come out of her room. Toddlers and preschoolers know every trick in the book. More drinks of water. One more minute playing with Lego. A trip to the potty. Another hug. Another stuffed animal. This can delay bedtime, and deprive parents of much-needed time to unwind in the evening. Try instituting a countdown that will help your toddler transition to bedtime, telling him that its 20 miniutes before bed, 10, and then 5. You may want to put together a sticker chart to award your child for not dawdling before bed, and promise a prixe after a certain number of stickers in a row. Monsters in the closet can feel very, very real to a frightened little one in the dark by herself. Talk to your child about her nighttime fears during the daytime, making sure that she doesn’t feel as if her fears are being considered “silly”. Consider putting nightlights in various positions in her room so that she can clearly see what is around her. If that doesn’t work, try a “monster spray”. Putting water and some vinegar or salt in a spray bottle and spraying the room to keep the monsters away can be a fun bedtime trick. And keep your child’s room cool, as studies have shown that a warm night-time temperature can increase nightmares and night terrors. What kinds of sleep challenges is your family facing right now? Share them in the comments section, and solicit help from your fellow parents!